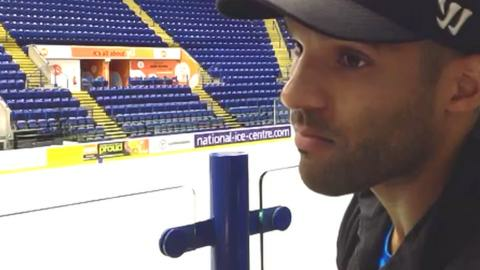 Forward David Clarke says Nottingham Panthers' crushing Challenge Cup semi-final success over fierce rivals Sheffield Steelers is further proof the team have found their true identity. Panthers humiliated Steelers 8-0 in the first leg on Tuesday and eased through with Wednesday's routine 2-0 home win. Victory in next month's final against Cardiff Devils in Sheffield would be Nottingham's sixth in seven years. "We've found our true identity and have plenty of confidence," Clarke said. "Going down the stretch this is where we wanted to be - we are still in the mix for everything." Following a run of five wins in their last six Elite League matches, Corey Neilson's Panthers side are third in the table, just six points adrift of leaders Cardiff with a game in hand. Clarke added: "Everyone wrote us off for the last six weeks but we know the league is a lot different to how it has been in the last few years. "There are a lot of good teams and fixtures you can lose. The league is still in our hands." Clarke said the performance in the second leg against Steelers was clinical. He added: "We got a good lead and the challenge was to play at the level again and I think we did for the majority of the game and got a solid win and progressed convincingly. "Anytime you beat your rivals it's important. Everything seemed to go our way and we are thrilled. "We wanted to play hard and dictate we had a lot of puck-possession and it was convincing win."